Get rid of distractions and focus on your current task. 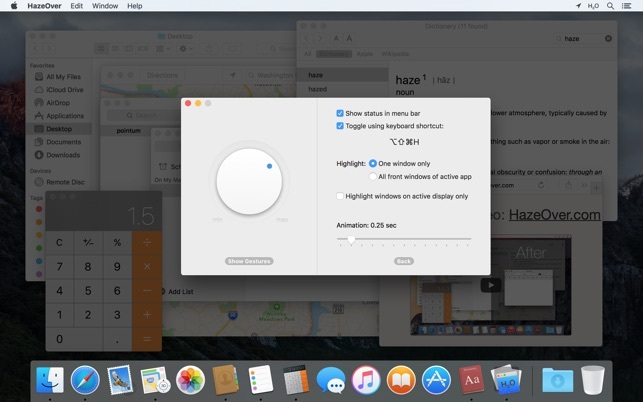 HazeOver automatically highlights the front app window by dimming all background windows. 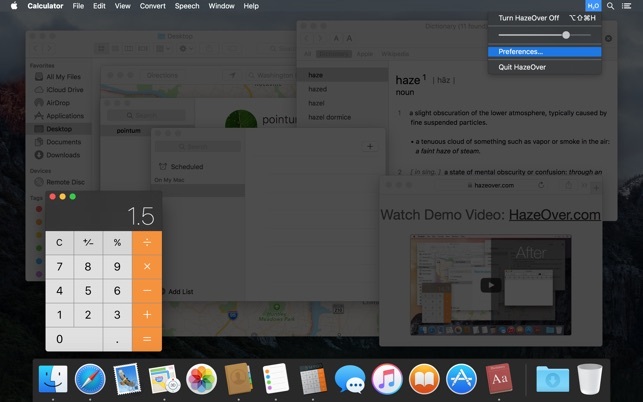 • Forget about having to minimize, close or hide windows to keep your Desktop sane. • Spend less time managing windows. Window clutter will no longer bother you. • Got a big screen? Then going full screen is not an option for you. HazeOver to the rescue! • Multiple displays? 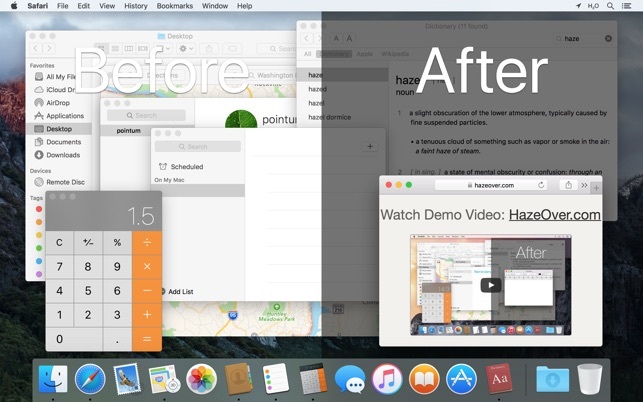 HazeOver will let you know which screen is focused or highlight a window on each monitor. • Working at night? 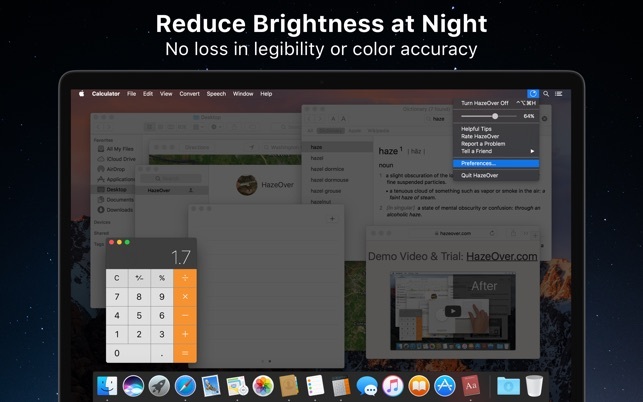 Reduce brightness of macOS interface without sacrificing legibility or color accuracy of the front window. 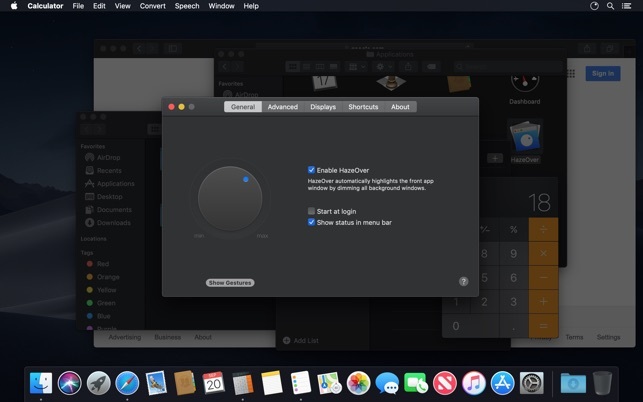 • Power up the Dark Mode in macOS Mojave and reduce background contrast. • Desktop is automatically revealed when used. 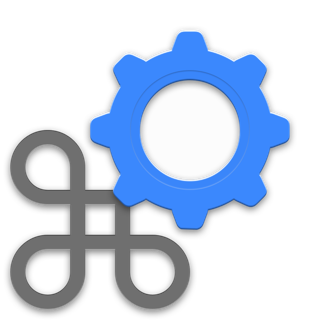 • Toggle the shade with a keyboard shortcut or adjust intensity with a gesture. • Dragging stuff between apps? Tap “fn” key and HazeOver will gracefully fade out. Does HazeOver really help? Check on LifeHacker, CNET, MacWorld, Engadget and Product Hunt. 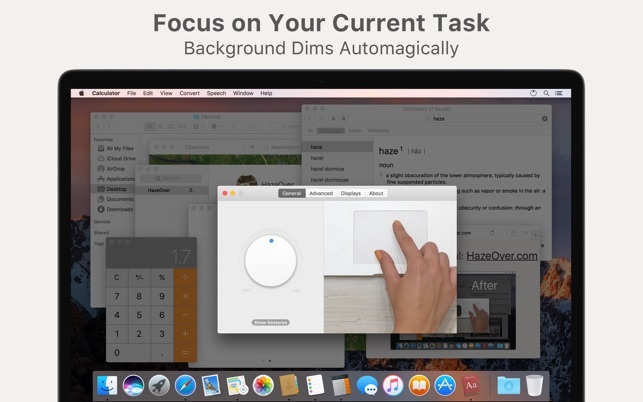 • Fixed: double-clicking menu bar icon to toggle dimming did not always work. • “Disable when using …” option can now be used for apps without Dock icon. 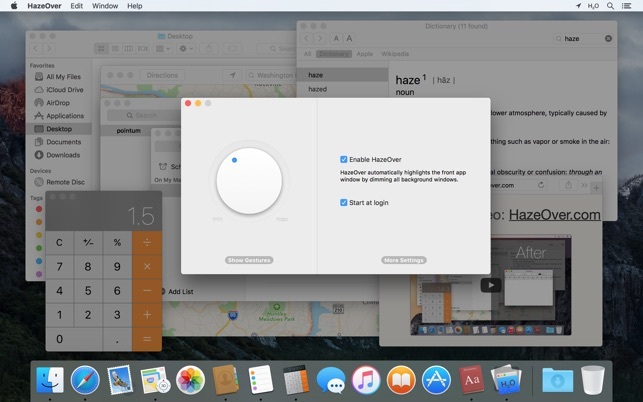 • Improved automatic Desktop revealing and support for Path Finder’s Desktop. • Fixed wrong dimming for: dragging a window between screens; switching between windows of the same app on different screens. 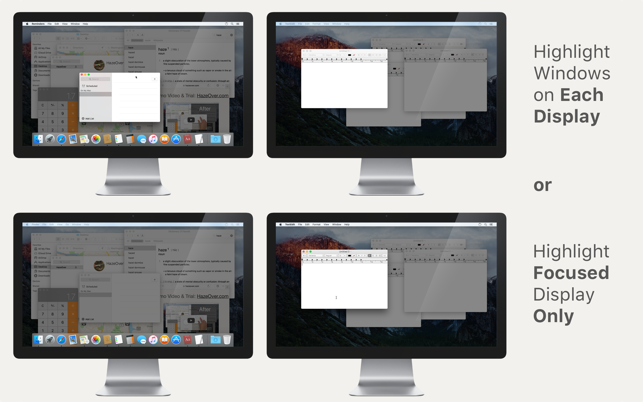 MacOSX doesn’t have window borders and modern style has lots of white space on everything, so if you have many open windows overlapping each other, it is hard to tell where one begins and where it ends. It is hard to know where to click the mouse to get the desired effect. I use Excel, Word, Outlook, Browsers, Calc, Terminal, etc… and I am frequently reading from one window while working in another, or copying/pasting. I have multiple monitors and many windows open for many hours every day. I love this app. It does just what I wanted it to do. See the pictures, they explain it. This app lets me know which app has focus without having to think about that question. It also removes the “clutter” and lets me focus on the app in the foreground. If, on the other hand, I just used a small laptop screen for the purpose of switching between web browser, email, itunes…. this app wouldn’t be needed for much. So great to have an app that a) works; b) does what it says it can do; and c) what it does is so helpful. If you’re like me and you’ve got 5 apps running, and multiple documents / files open and all laying there llike a strewn deck of cards after a drunken poker game, and you’re saying “I just want to block out all that distraction, even momentarily, while I laser-like focus on this one document…” - get this. It’s a superb app, and for a pittance! And it’s NOT one of those crappy amateur apps that are more headache than solution. 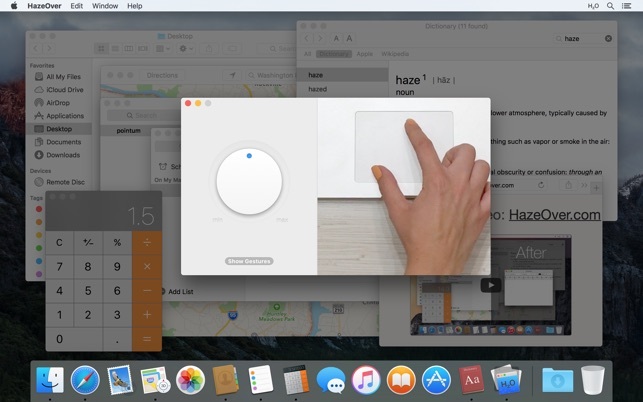 It sits up there in the way-top menu bar and you turn it on and off at your whim. You choose your background blockout color and even its degree of opacity. And you can bring back your chaos at will. Thank you. You’ve made me smile with the poker analogy. 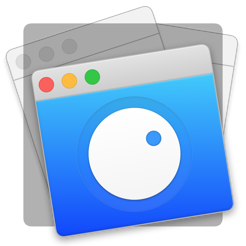 The app looks simple in principle, but it was hard to make it account for corner cases in OS and some third-party apps. As many reviewers state, I was a bit hesitant to spend even a couple dollars on something that seems pretty mundane. I mean, what will graying out background screens really do to boost productivity & focus? Plus, most of my work is done in full screen windows anyways. As I’m working on a Keynote presentation, however, and try to toggle between that and the internet browser, I realize the gray out is in fact SUPER helpful! This app is so simple and straightforward, I don’t think there’s much else to say. The gray out keeps my eyes stay focused the window at hand while keeping others accessible for use. I have a feeling I’ll be working split screen more often now!